Built by the Saxons on the River Wye, Hereford (pop. 55,000) is now the quiet county town of Herefordshire, mostly famous for its 11th-century cathedral, its Mappa Mundi, and the local breed of Hereford cattle. Hereford was established as a defensive outpost at the border of Wales. The town's name means "Army Ford" in Saxon, and the region of Herefordshire, Shropshire and Worcestershire is known as the Marches, meaning "boundary" (from which the title of Marquess also derives). In 794, young King Ethelbert of the East Angles came to Mercia to marry the daughter of King Offa. The latter (or his queen) instead of celebrate the events, however, had him murdered. Ethelbert became a saint soon afterwards and a cathedral was errected in his honour. 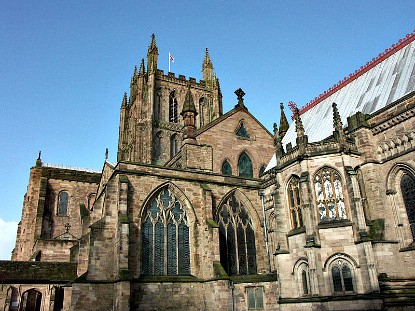 Hereford Cathedral was first built between 1020 and 1040. It was destroyed by the Welsh in 1055, and much of the present structure was rebuilt by the Normans from 1107 to 1148, making it one of the oldest cathedral in England. In 1282, Thomas Cantilupe, bishop of Hereford , dies in Italy. His bones are brought back to Hereford, a shrine is created (now in the North Transept) and he becomes the second local saint in 1320. 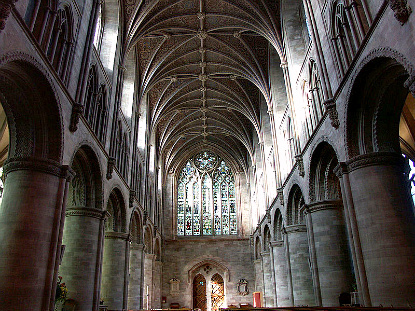 On Easter Monday 1786, the west front and west tower collapse into the nave, which had to be reconstructed (though slightly altered) by architect James Wyatt in the ensuing years. The most valuable treasure of the cathedral is its 13th-century world map, known by its Latin name of Mappa Mundi. One of the particularity of the map is that it represents the knowledge of the world of its creator, giving us precious information on how people at the time interpreted the world both in spiritual and geographical terms. 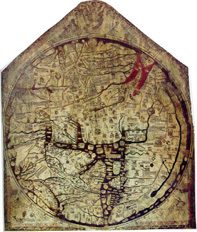 There are several such maps surviving in Europe, but Hereford's is the largest (1.58 x 1.33m) and best preserved of all. The Mappa Mundi was drawn on vellum (calf skin) and depicts about 420 cities and towns, 15 Biblical events, 33 plants, animals, birds and strange creatures, 32 images of the peoples of the world and 8 pictures from classical mythology. Another fascinating historical treasure of Hereford is its Chained Library, also the largest of its kind in the world. It contains 229 medieval manuscripts and 1800 books ranging from the 8th to the 19th century. Chains were used as a security system until the 18th century. Those of Hereford's library date from the 17th century are are still intact (including the locks and rods). The oldest book here is the Hereford Gospels, written in the 8th century. The Mappa Mundi and Chained Library share the same entry ticket (£4.50/adult, £3.50/concession). The exhibition is open from 10am to 4:15pm from May to September, and 11am to 3:15pm from October to April. It is closed on Sundays. Trains link Hereford to London Paddington (3h to 3h20min, £31) via Worcester or Newport (Wales). There are direct trains to Worcester (45min, £6), Shrewsbury (1h, £12.20) and Birmingham (1h20min, £11.30). National Express has buses to London (4h to 6h, £16.50) and Gloucester (50min to 1h30, £4.75), among others.